Every couple of years, the SheppyBrew Beer Master is dragged to a family reunion on his wife's mom's and step-dad's side of the family. His wife (aka the SheppyBrew Beer Model) has 5 brothers in this reunion. One is her actual brother and four are her step-dad's sons. Each of those brothers are married and each of them has at least 2 kids. Every two years, this whole group rents a house somewhere and spends a week together. Amazingly, everyone gets along well and there is none of the drama you would typically imagine with this large of a group. These reunions have been named "T.RA.SH.". T is the first letter of my wife's maiden name and her brother's last name. RA are the first two letters in the last name of most of the people at this reunion.... the Beer Model's mom, dad, four step brothers, and all their wives and kids. SH are the first two letters of our last name. Together, that makes T RA SH. Actually, not a bad name for the group. Generally speaking, there is a fair amount of beer-drinking going on at these reunions. In this context, "generally speaking" actually means "every time". "Fair amount" actually means "a ton". For the most part, it is the typical cheap BMC variety of beer, but I actually don't mind. I've always thought (since I started brewing way back in 2009) that I should brew a special beer to bring to these things. Since I've been brewing, they have been far enough away that we had to fly, and that is true again this year. I can't bring a 5 gallon corny on the plane, though. Even though I can't bring a keg, I thought I'd make a TRASH beer for the Beer Model and myself. I figured it should be light colored as most of this group likes those mass-produced light lagers, but I didn't want to make it too light in flavor. Most of the family is of Mexican decent, so I thought it would be appropriate to use White Labs #WLP940, Mexican Lager Yeast. I decided to basically go with a Vienna Lager recipe except a little lighter in color. I think it will turn out well. Of course, I will let you know. For more information about this beer on my blog, see Sheppy's Blog: T.R.A.S.H. .
Make 3 liter yeast starter a couple of days before brew day. Bought ingredients for batch #3 today. Changed up the recipe a bit. Took out Carafa and replaced the 10L Munich with 30L Munich. Made a 6 cup starter Today. First time using a stir plate. Seems to be working very well. Brew day in garage today went well. 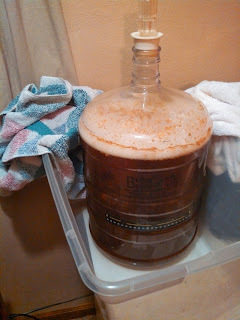 Gravity at 1.049. Pitched a little over 50. I'm going to call the fg on this 1.010. 5.1% abv. Flavor is what I remember from previous versions of this beer. Nice, floral, almost fruit hop presence. Balanced. Beautiful beer. Time to keg it up. This is now in the keggerator. Nicely carbonated now. Had a few over the weekend. Wonderful bready malt flavor with the noble, floral hop flavor and aroma. Very well balanced. Not sweet, but certainly not bitter. Good clarity. Just a very nice beer. The Ramirez couple is visiting and day they really like this beer. It might just be that their picture is on the tap handle. It is delicious, though. Brought keg to a Ramirez house. Killed it.